Today was a day of birthdays! My beloved nephew turned 21 (yeah, I cant quite believe it myself!) and dear friends celebrated their, and their children’s, birthdays with a huge bash this afternoon. I wanted to contribute something, and so I made cookies! About 200 Starry Starry Night Cookies (4 batches) and about 200 of these gorgeous decorated gingersnap cookies. 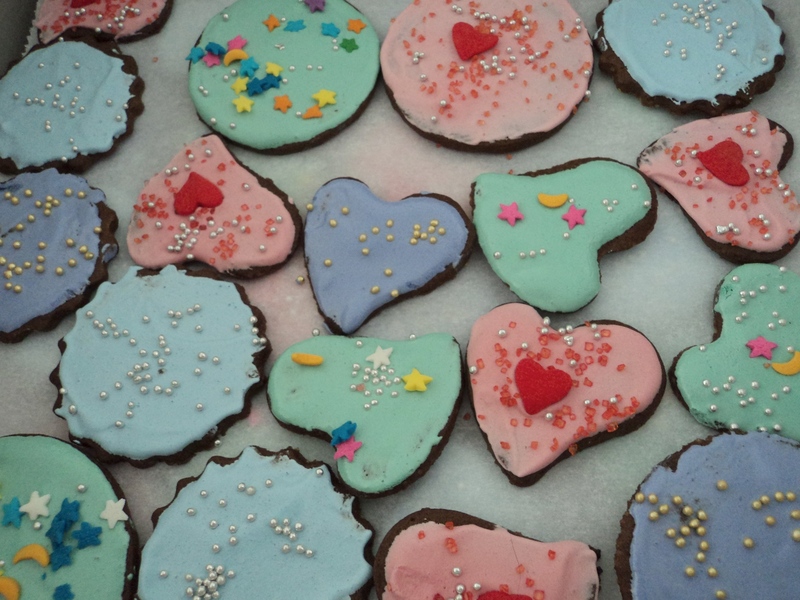 I was going to make sugar cookies, as I did for my sayang niece’s 1st birthday, but I thought I would try something different – and I do love a good, crisp ginger cookie. These make fantastic gingerbread people, and they last for ages (no eggs, so they dont go soft quickly) – you could poke hole in them (with a straw or chopstick) and use them as stunningly pretty decorations on a tree for Christmas. I used Royal Icing for the cookies, and it set hard, and gorgeous. And because it was a children’s party, I used IndiaTree natural food colours – they were the loveliest shades of pastel – pink, robin’s egg blue, violet and spring green. Before the icing set, I decorated them with tiny silver and gold dragees, hearts, sparkle sugar, and colourful hard sugar confetti. They looked luscious, and they tasted pretty great too! The other thing I loved about these cookies were they were a snap (hehe) to make – but you need to be really organised and focused. I made 2 batches of dough, each divided into 4. Rolled out, and frozen overnight, and then cut with small and large shapes. I stuck with hearts and circles, but you could make animals, letters, stars… anything actually that you can find as a cookie cutter. They take about 10 – 15 minutes to bake. Decorating can take a bit longer! If you prefer chewy cookies, roll out a bit thicker, and cut and bake until the centres are just firm. Either way, involve the young people in your life in the decoration. You will be overjoyed by their creativity, and your cookies will be uniquely beautiful. Makes about 20 – 25 gingerbread people or 80 – 100 gingersnap cookies (depending on the size of your cookie cutter). Any leftover can be frozen, rolled out, for later use. In a large stand mixer, or large bowl if youre using a handheld mixer, combine the flour, sugar, cinnamon, ginger, all spice, nutmeg, cloves, salt and baking soda. Mix briefly so all are combined well. Add the butter, cut into large chunks, and mix again. The butter will “cut” into the flour mixture, and will become coated with it – and the bowl will look like it contains a sandy mixture of small dark pellets. Add the molasses and mix again. The dough will start coming together with the addition of the molasses. I usually add the milk to the measuring cup which held the molasses, and stir it around a bit to capture any molasses that was left behind. Add the milk, and mix just briefly. You will have a very very soft dough. Turn out onto a sheet of wax paper, and divide into four even pieces. Working quickly, form a disc with each piece, wrap tightly in individual pieces of wax paper, and transfer to the fridge to firm up for about 30 minutes or so. Once the dough has firmed (it will still be pliable, but will just be a little easier to work with), place a piece of wax paper on your working surface, then a disc of dough, and cover with a second piece of wax paper. Roll out quite thinly and evenly. You now need to freeze the dough for about half an hour (and even overnight if you wish) – you could also refrigerate it, but I find it works quite well coming out of the freezer. Given that this is the tropics, frozen dough is much easier to work with. Once you have frozen or refrigerated the dough, and are ready to bake, prepare your oven. Preheat to 160C (325F). Remove one sheet of dough from the freezer. Peel the top layer of wax paper off the dough, and then replace it onto the dough sheet (this helps in making the dough easy to remove once its been cut). Flip the sheet over, and remove the (now) top layer of wax paper. I used this wax paper to line my baking sheets. Cut out shapes and patterns to your heart’s content, and place on a baking sheet lined with wax paper. Bake in the hot oven for about 10 – 15 minutes, or until the cookies have puffed (from the baking soda), and deflated, have darkened just a bit, and are firm in the centre to your touch. Remove and allow cookies to cool for about 5 minutes on the baking sheet, and then transfer to a rack (or even a plate – they should be pretty cool and hardy by now). Repeat with the remaining dough. Decorate as you like, or have them perfectly naked – a spicy wonderful happy making gingersnap. Any scraps can be gathered together, formed into a disc, refrigerated, rolled out, frozen and re-cut.